The face is really the last place you want unsightly vein problems. People always look at your face. Make a booking today to safely and effectively remove your rosacea facial veins. Lift your self-confidence. We have three treatments, laser, E-light and IPL. E-light uses a combination of IPL and RF, two treatments in one. E-light is probably our preferred option, but everyone's skin is different. We will help you choose the best treatment for you. If you are not sure book in for a free consultation. We have three treatments, laser, E-light and IPL. They are both safe and effective treatments. Book a free consultation and we can discuss the merits of each treatment. We can answer any questions and give you a price for each treatment. If you decide to go ahead we, will ask some medical history questions. If you are suitable we will ask you to fill in and informed consent form and start the treatment. The YAG laser, E-light or IPL is fired at the facial veins area, the veins are heated up and destroyed. The tiny particles are then easily processed and eliminated by the body. Most customers undergo a ten-minute treatment. A mild to moderate irritation of the overlying skin is to be expected for a few days to a week. 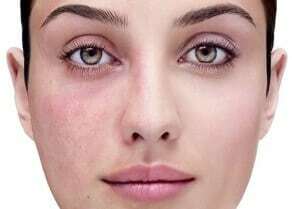 Depending on the depth and amount of rosacea to be removed. Reduction or removal of unsightly facial veins, may greatly improve one’s sense of confidence and self-esteem. This treatment has a very good track record for safety and precision. The facial vein area could become slightly irritated for a few days to a week. Side effects are rare and generally temporary. The specific risks and the suitability of these procedures. For an individual can be determined, only at the time of consultation. All procedures have some degree of risk. Minor complications that do not affect the outcome occur occasionally. Customers who have had facial treatments may take off a few days. While those that have body, hands or other areas treatments usually return to their normal activity the next day. YAG laser, E-light or IPL treatments cause a slight sting. Anaesthetics is not a normal requirement for most customers. However, those with very sensitive skin may apply a numbing cream 30 minutes before the procedure. Wash the area with a mild soap and gently dry, apply a moisturizer to the skin. Avoid excessive sun exposure and tanning for one week after your treatment. Consider the use of sunscreens. Customers who undergo the treatment to remove facial veins should consider the use of Vitamin K cream and sunscreen after the procedure. We the very latest in 980 lasers, why is that important? Because the 980 laser in most cases can remove veins in one treatment. Which saves you time and money. Talk to us today about starting your best safe effective rosacea facial vein removal treatment today. For an all over whole body experience come and see us in Lane Cove on the North Shore. Come and relax in our opulent ambiance, welcoming staff, the scent of essential oils, calming music, the soft cool breeze. For world class, exclusive treatments and products, we are the beauty and skin care experts in Lane Cove on the North Shore.